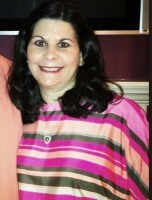 Kathy has a degree in Computer Science from Southeastern Louisiana University. 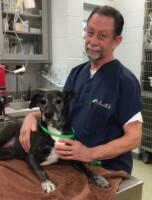 She met John at SLU, and they were married before he entered LSU Veterinary School. After growing their family and settling down in Mandeville, they decided to open their own hospital. With her degree and her love of animals, she decided to take on the business and become the hospital manager. She now works part-time and enjoys time off with her grandchildren, Myles and Sloan. Brittany is the daughter-in-law of John and Kathy DeVun. She started working with us in 2012 after graduating from LSU with a Bachelor’s degree in Business Management. She is married to her husband Justin, who works in Veterinary Sales, and has two children, Myles and Sloan. Outside of work, Brittany enjoys traveling, shopping and watching LSU football. She also has two dogs, Ace and Daisy. 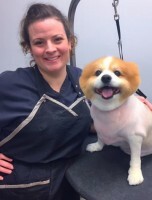 Alexis has been grooming for over 15 years and has been working with us since the day we opened in 2005. 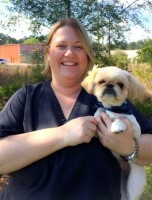 She attended Paragon School of Pet Grooming in Michigan where she received the “Rising Star” award. She enjoys camping and spending free time at the lakefront with her husband, Bert, and two children, Quinn and Sawyer. Alexis is also a fan of the New Orleans Saints. Who Dat! 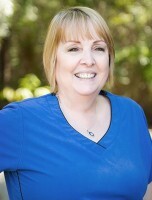 Ann joined our staff in 2006 and has worked in Veterinary Medicine for over 20 years. 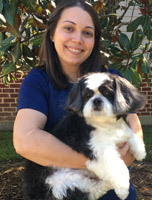 She attended Florida’s St. Petersburg as well as Delgado’s Veterinary Technician program and has a Bachelor’s and Associate’s degree in Veterinary Technology. In her spare time, she enjoys being outside and gardening. She has two dogs, Peyton and Luca, and one cat, Agnes. Morgann has been a team member since 2015. She attended Southeastern Louisiana University and graduated in Criminal Justice with a minor in Sociology. She followed a new path and followed her heart to work with animals. She is married to her husband, Jeremy, and has a black lab named Maggie. Outside of work, Morgan is an avid coffee drinker and enjoys exercising. Donna joined our staff 6 months after opening, in 2005. She works part-time in our hospital and also works at a local dental office. Donna enjoys being our funniest staff member and brightens our office with her wit. She has three dogs, Baxter, Hope Marie, and Lazard as well as two cats, Faith and Mickey. Dwight joined our hospital in 2016. He graduated from Southwestern with a degree in Microbiology. After working in the Petro-Chem field doing environmental safety, he decided he wanted a change. He has a deep love of animals and has three dogs, Buster, PeeWee and Luke. He is married to his wife, Vicki, has three sons and four grandchildren. He enjoys bicycling, being a handy-man and spending time with his family. Cat has been a member of our team since 2009. 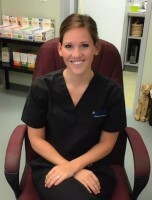 She left retail in order to pursue her passion for animals and work in a veterinary hospital. She enjoys reading, exercising and spending time with her family. She is married to her husband, Chris, and has two children, Gabby and Christian. She also has a dog, Rosie and a rabbit, Briar. Michael enjoys helping with the family business in his spare time. On days the hospital is closed, he gives his time to taking care of our patients who are boarding or hospitalized. Michael is a professional firefighter and owns his own business, Hardline Fabrication. He enjoys spending time outdoors with his dog, Riddick and also has many chickens! Jessica became a member of our team in 2017. She has a degree in Biology from Southeastern Louisiana University. After college, Jessica spent two years as a Zookeeper at the Audubon Zoo in New Orleans and then moved to the Northshore and became a Veterinary Technician for small animals. She has a passion for exotic animals and in her spare time, started a non-profit organization for Lemurs, the Louisiana Lemur Foundation. She is engaged and currently planning her wedding for October of 2018.